Every effort was given to identify everyone involved with the strips and if anyone was left out or misidentified the publisher expresses their regrets. This was an era when only the creator of a strip or comic book was given any credit at all. It would be many years before letters to the editor were included and readers would ask who wrote, drew, or inked the pages of their favorite book or strip. Bill Finger was selling shoes when he met cartoonist, Bob Kane at a party in 1938. They collaborated on many adventure strips. Within a year, Batman appeared in Detective Comics #27 and 28. Finger wrote those first two adventures in Detective Comics. Kane is credited with being the creator of Batman, but it has been inferred many times that Finger was actually a co-creator. Any truth in the matter is lost to the mists of history. The book starts out with a synopsis of each storyline plus who is credited as either, the writer, penciler, and inker of each. Following that is a biography of the afore mentioned writers and artists. Many of the artists and writers did work for most of the publishing houses of the day; places like: Charleton, King Features, Harvey, Timely (Marvel), DC and others. Whit Ellsworth was the DC contact with Fleisher Studios that did the Superman animations in the forties and he also Worked on the Adventures of Superman TV show in the fifties. 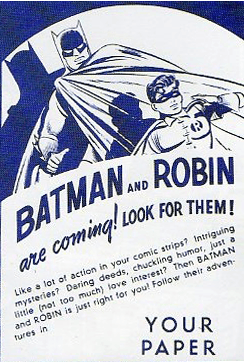 There are recreations of promotional pieces that were run in daily newspapers to promote the coming of Batman & Robin as a recurring strip in each publication. Alas, my local papers in New Jersey did not run the strips and I had no knowledge of them until I was well into adulthood. Much of the Batman & Robin’s general history appears in the dailies, many unique points appear in the Sunday strips. 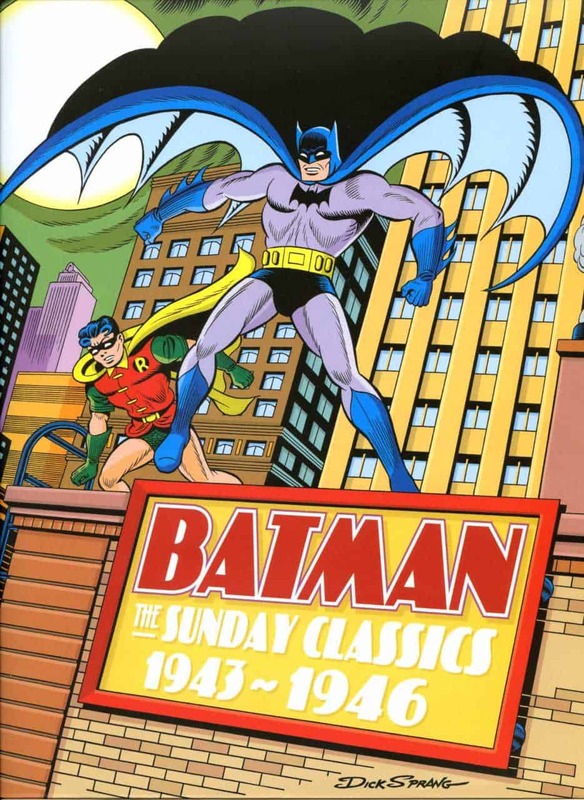 Batman the Sunday Classics have been lovingly redone in more brilliant colors with subtle flesh tones and other gradations. The Batman & Robin of this era spent much of their crusading time catching mere crooks by solving strange clues rather than the super crooks and alien threats of today. These were fun stories and had some humor and whimsy to their makeup. There were mysteries, and other crimes that had to be solved in Batman’s own special way because crooks are a superstitious cowardly lot.